One day passes and another fight gets added to the talent roster scheduled for UFC 121 in Anaheim, California. 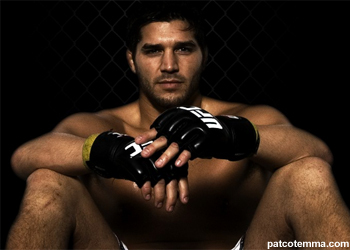 Reports are surfacing that middleweights Patrick Cote and Tom Lawlor will be facing off inside the Honda Center in Anaheim, CA. MMAJunkie has confirmed with sources close to the situation that the two fighters have signed their bout agreements, however were unable to verify whether the contest would appear on the televised portion of the pay-per-view broadcast. Both Cote and Lawlor are in desperate need of wins, but for completely different reasons. The French-Canadian is looking to climb back into the 185-pound title picture while the former TUF contestant is hoping to keep his job. Since beating C.B. Dollaway at UFC 100, Lawlor has dropped two straight fights including an upset loss to Joe Doerksen in his last outing. Cote on the other hand, returned from a 17-month layoff only to get submitted by Alan Belcher in front of his hometown crowd at UFC 113. It was Cote’s second straight loss, with the other coming at the hands of reigning champion Anderson Silva at UFC 90. UFC 121 is scheduled to go down October 23rd and will be headlined by a heavyweight title bout between champion Brock Lesnar and No. 1 contender Cain Velasquez. Even though October is still a few months away, there is a lot of anticipation brewing for the UFC’s return to Southern California.